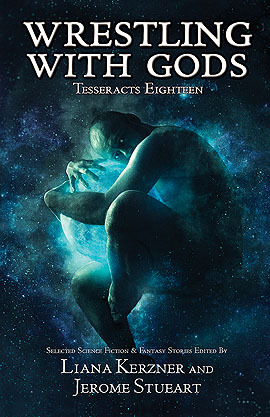 Wrestling With Gods: Tesseracts Eighteen will have its book launch at the Merril Collection of Science Fiction, Speculation & Fantasy at the Lillian H. Smith branch. 239 College Street, Toronto, on Thursday, April 30, 2015, at 7:00 p.m.
Come meet the editors and some of the authors. Copies of the anthology will be sold by Bakka-Phoenix Books at the library. A mechanical Jesus for your shrine, the myths of cuttlefish, a vampire in residential schools, a Muslim woman who wants to get closer, surgically, to her god, the demons of outer space, the downside of Nirvana. The 24 science fiction and fantasy stories and poems included in Wrestling with Gods (Tesseracts Eighteen) take their faith and religion into the future, into the weird and comic and thought-provoking spaces where science fiction and fantasy has really always gone, struggling with higher powers, gods, the limits of technology, the limits of spiritual experience. “Wrestling with Gods (Tesseracts Eighteen)” features works by: Derwin Mak, Robert J. Sawyer, Tony Pi, S. L. Nickerson, Janet K. Nicolson, John Park, Mary-Jean Harris, David Clink, Mary Pletsch, Jennifer Rahn, Alyxandra Harvey, Halli Lilburn, John Bell, David Jón Fuller, Carla Richards, Matthew Hughes, J. M. Frey, Steve Stanton, Erling Friis-Baastad, James Bambury, Savithri Machiraju, Jen Laface and Andrew Czarnietzki, David Fraser, Suzanne M. McNabb, and Megan Fennell.